as a substrate for the Tricarboxylic Acid (Krebs) cycle. Aspartic acid is thought to facilitate the adequate supply of energy available to active tissues such as the heart and skeletal muscles. Potassium and magnesium salts of aspartic acid have been used in related double-blind research. 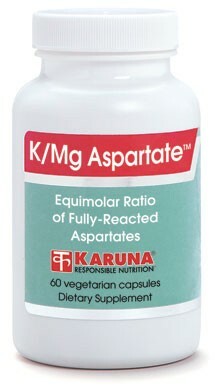 Two grams per day of an equimolar ratio of fully-reacted aspartates has been recommended to support cellular bioenergetic mechanisms. Vitamin B6 is included as a cofactor for magnesium utilization. Suggested use for adults: One capsule twice daily, or as directed.